Included in the British Art Show 1990 my paintings have been exhibited widely in both the UK and internationally. 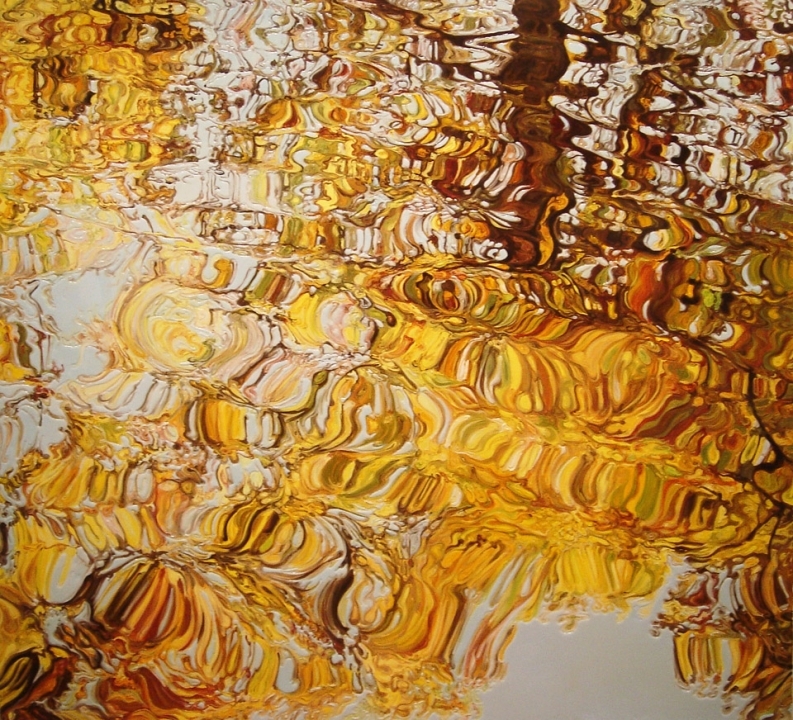 Represented by Locks Gallery Philadelphia Kate Bright lives and works in London. Interested in depicting the landscape and exploring the value and interpretation of materials, my paintings are made with the addition of glitter, glass, polystyrene or resin collaged to the surface of the canvas. 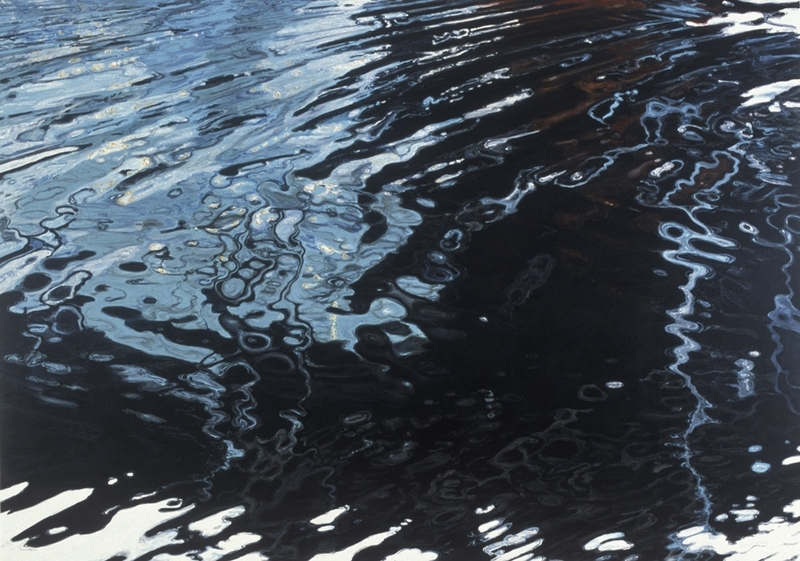 Colluding with mass culture the paintings explore the value of the sublime and the illusory aspects of ‘straight’ painting. Extending the landscape genre through this use of unorthodox materials, the collage element (my understudy for the twinkle of frosty snow, white horses crashing on the beach and the lazy ripple of the boating lake) enforces a low grade interactivity onto what might appear to be the static familiar genre of landscape painting. 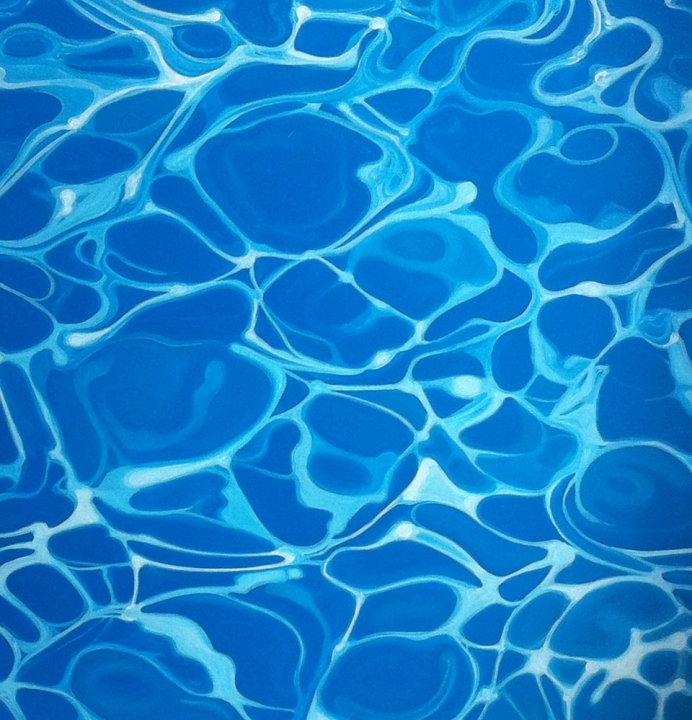 Highlighting the underlying artificiality of paint the trompe-l’oeil and the figurative, the work confronts the viewer to re-assess the notion of painting and what might make a landscape painting contemporary. Material: Wood – Art & Design, a threefold programme comprised of an exhibition, festival and hands-on making experiences. Set in a thirteenth-century barn – the largest thatched building in the country – artists and makers including Thomas Heatherwick, Gareth Neal, Chris Eckersley, Richard Woods, Rob and Nick Carter and Alastair Mackie lead a survey of contemporary making practices in wood, with a focus on chair design. Russell Pinch and Christopher Kurtz. Malevolent Eldritch Shrieking is a large diverse international salon-style multigenerational exhibition about painting (in some aspect) initiated by Paul Morrison. The exhibition includes work by Jan Albers, Sue Arrowsmith, Paul Barlow, Eric Bainbridge, Anthony Bennett, Michael Bevilacqua, Merijn Bolink, Juan Bolivar, Kate Bright, Ralf Broeg, Glenn Brown, Simon Campbell, John Chilver, Sacha Craddock, Michael Craig-Martin, Hansjoerg Dobliar, Rowena Dring, Marcel van Eeden, Machiko Edmondson, Tim Eitel, Roberto Ekholm, Dee Ferris, Gail Fitzgerald, Saul Fletcher, Ed Fornieles, Torben Giehler, Lothar Goetz, Deme Georghiou, Brian Griffiths, Terry Haggerty, Jane Harris, Matthew Harrison, Karolyn Hatton, Gerard Hemsworth, Gregor Hildebrandt, Stefan Hirsig, Dale Holmes, Paul Housley, Tom Howse, Des Hughes, Richard Jacobs, Ben Judd, Ben Kaufmann, Scott King, Richard Kirwan, Rannva Kunoy, Langlands & Bell, Des Lawrence, Christoph Lohmann, Bob Matthews, Caroline McCarthy, Penny McCarthy, Peter McDonald, Dominic McGill, Robert McNally, Dawn Mellor, Nathaniel Mellors, Jo Melvin, Robert Moon, Ryan Mosley, Jost Münster, Julian Opie, Carl Ostendarp, Helena Petersen, Michael Petry, Daniel Pettitt, Jan van der Ploeg, James Pyman, Ged Quinn, Barry Reigate, Bernd Ribbeck, Darren Richardson, Mark Riddington, David Risley, Ben Rivers, Neil Rumming, Lesley Sanderson & Neil Conroy, Sophie Schmidt, Gary Simmonds, Dillwyn Smith, Maxima Smith, Stephen Snoddy, Michael Stubbs, Daniel Sturgis, Srinivas Surti, Tomoaki Suzuki, Finlay Taylor, David Thorpe, Dimitra Vamiali, Riette Wanders, Mathew Weir, Richard Wentworth, Lucy Williams, Keith Wilson, Martin Wöhrl, Clare Woods, Richard Woods, Will Yackulic and more. The show opens on Saturday 24 March 2-4pm at Attercliffe™ in Sheffield and will be open by appointment until Saturday 5 May. Exhibiton of two films made at the week long residency at Letheringham Lodge exhibited on site in the buildings at the Lodge and grounds. Commission to celebrate the 200th anniversary of John Constable's painting Wivenhoe Park. As part of the Sidney Nolan Centenary celebrations, the Sidney Nolan Trust has developed an international artist residency opportunity which involves a group exhibition at the Rodd, Herefordshire, and a four-week residency at the Bundanon Trust, New South Wales, Australia. Three artists have been shortlisted for the group exhibition at the Rodd which will take place between 8 September and 30 September 2017. 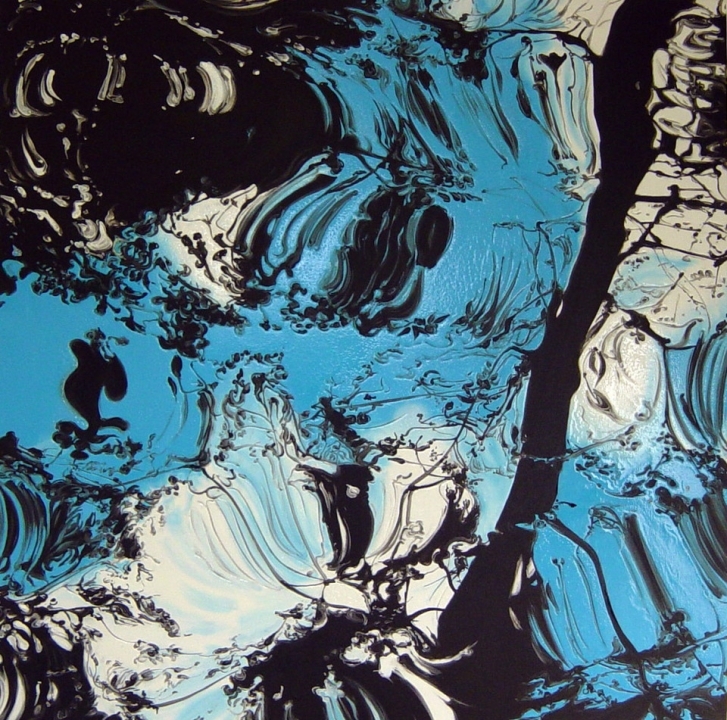 Bright is known for landscape paintings that have utilized a range of collage elements: glitter, polystyrene balls, resin, or glass. 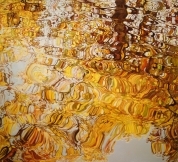 In a 2001 interview with Stephen Hepworth she stated, “The glitter, from the moment I picked it up, was screaming to be sunshine…” This earnest association with the material, removed from its associations with craft and kitsch, allows her to evoke her own desire for visual surprise within the experience of a painting. 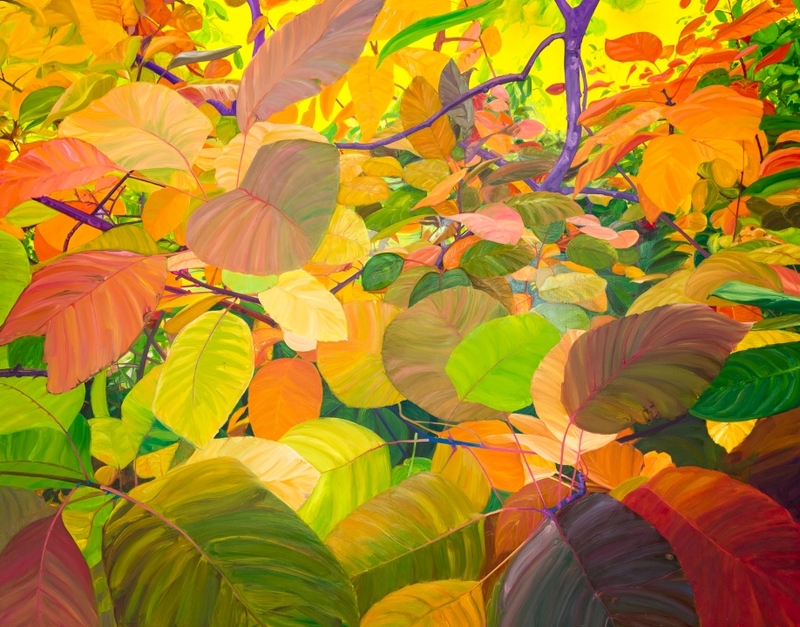 The “edge” in the work is twofold: figuratively as the cusp or failure of realism in painting and also literally in the edges of the landscape where shrubs, vines, and plant life grow wildly. The works constantly remind us of their two dimensionality through their collaged surfaces: a simulacrum of experience beyond painterly representation. 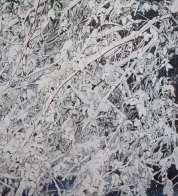 The perspective of previously exhibited winter paintings gazed down snow-covered paths with distinct vanishing points or looked up at snow covered branches against a blue sky. 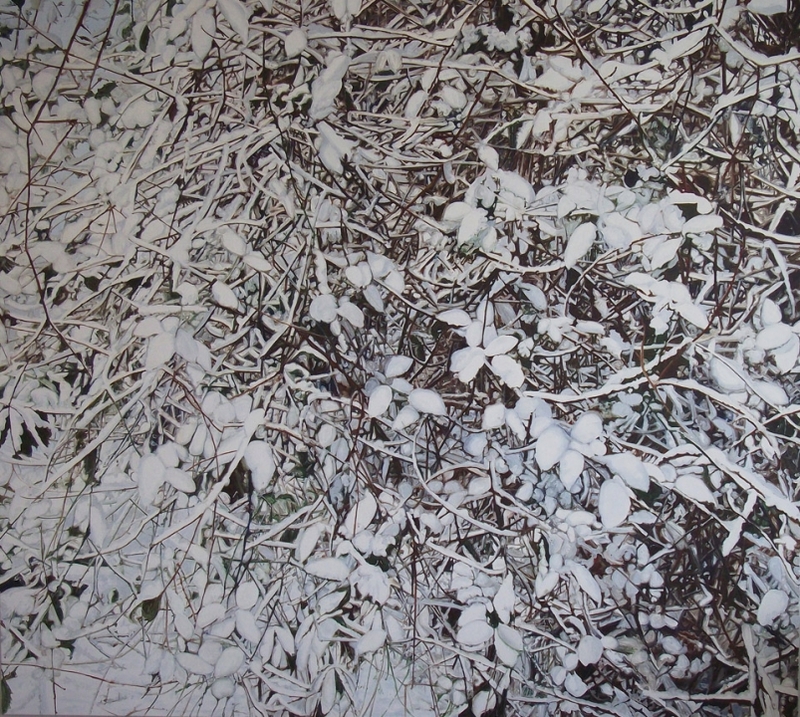 These new works look downwards, inwards, and through brambles. Visually tangled, they are marked by a more realistic hand but also a disorienting abstraction. The branches become elegant line drawings from afar. Occasionally they are smothered with both the depicted snow and thick layers of glitter, but other times left under the weight of their own image with little to no glitter to be seen. The approach is indebted to the art historical traditions of romantic landscape painting, reflecting the mythic experience and desire for beauty we attribute to the landscape as much as the place itself. 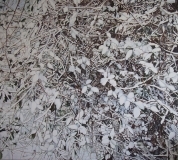 Moreover, in an era where art increasingly lives online and through photographs, the snow paintings defy photographic simplification and must truly be appreciated by the naked eye. Group Show at Eleven Gallery. Annual Winter exhibition. Exhibition of paintings and wall works exhibited at L'Escargot dining rooms. The first French Restaurant in London, L'Escargot was opened in 1927. The building houses its own art collection including work by Dali, Matisse, Grayson Perry, Peter Blake and Andrew Logan, the exhibition set up to augment this collection included works by Phil Allen, Susan Collins, David Burrows, Dan Coombs, Mali Morris, Andrew Stahl, Mike Sliva, Jeff Dennis, Jeffrey Camp. Group of commissioned paintings for The House Of St Barnabus London. 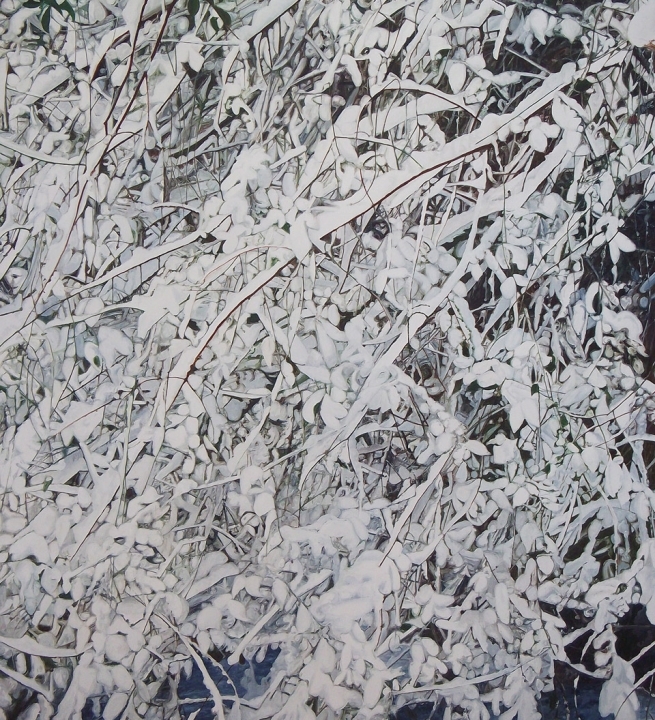 Paintings exploring the theme of wastelands transformed after snowfall. Glitter is used in the paintings as a mimic. Rendering the natural without being of it, an understudy for the twinkle of frosty snow and the transformative physical power of snowfall. The collage element in the work reflects the function of landscape painting, creating an image that is essentially decorative and highlighting the underlying artificiality of paint and the illusionary aspects of straight painting. 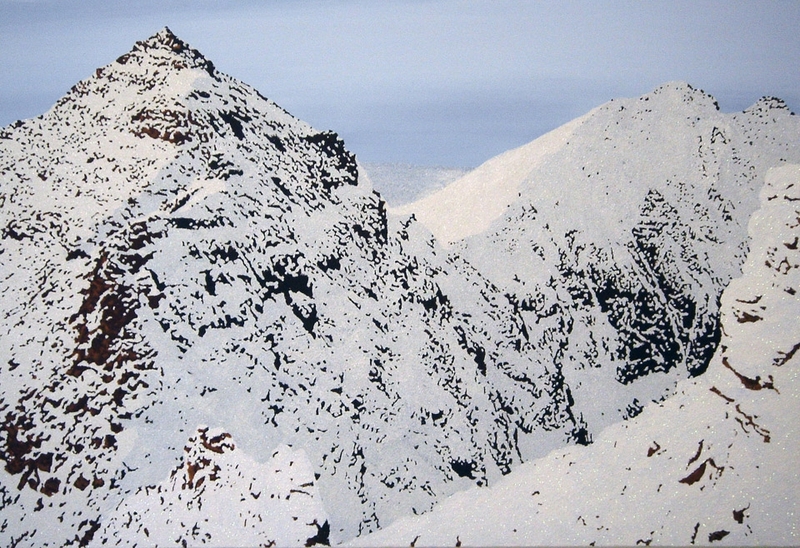 The paintings provide and equivalency, a referential contact point to real experience. Solo show of Six large paintings 5' x 7' and 5' x 5' with 7 smaller works exhibited 24" x 24' at Locks Gallery Philadelphia. 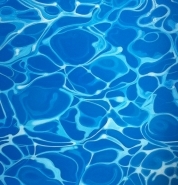 Paintings were concerned with the depiction of pools and the water's surface and reflections whether from the dark ghostly shadows of an underground lake to the bright dayglo of the reflected artificial light of a competition swimming pool. Using glitter, glass and thick varnish to augment the painting and re-enforce the presentation of illusion. The paintings further the dialogue between the figurative image presented and the expectation and understanding of the audience. IN addition to the exhibition I was invited to talk at Moore College of Art's "In Conversation" programme interviewed by Barry Schwabsky. Also I spoke about the exhibition to freshmen at Tyler School of Art as part of their 1st Semester programme. 49th Venice Biennale International Exhibition of Contemporary Art, Gallery Holly Snapp, Venice, 6 June - 25 July 2001. Another Country: The Constructed Landscape, a multi-venue group exhibition of landscape drawings and paintings organized by artist and curator Augusto Arbizo. Contrary to the notion of painting en plein air, many of the artists in the exhibition construct their landscapes in the studio and are inspired by markedly different ideas, including memory, science fiction, suburbia, surrealism, popular culture, and the actual practice of painting. What is particularly interesting is their concept of place as a reference for travel, fantasy and escape. Palazzo Permanente, Milan, Galleria Del Chiostro Della Chiesa, Rome, L'Espace Pierre Cardin, Paris, Academy Italiana London. In July 2001 I collaborated with Mario Testino who was guest editor for the magazine Dutch augmenting his photographs to make an artwork that was published in the July-August issue of the magazine. 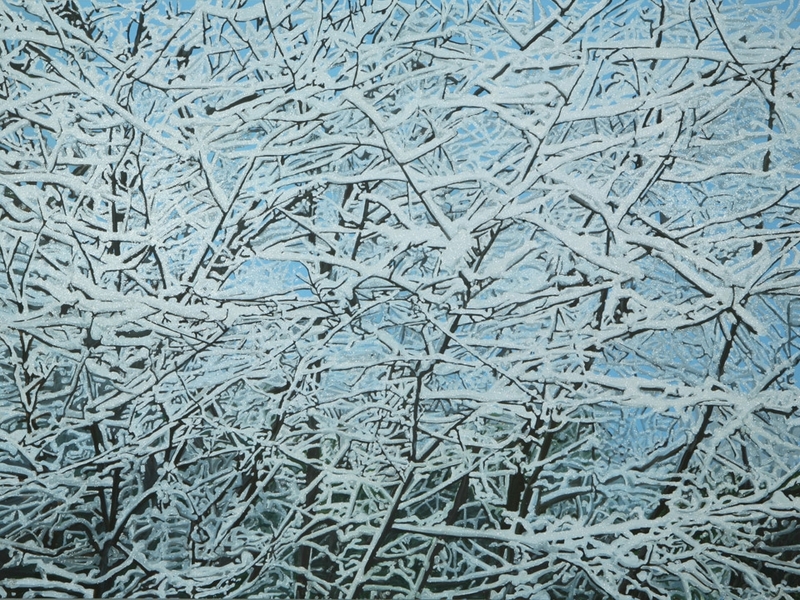 The print Snowfall 2013, mixed media, is to be made available to fund arts programmes for patients and staff and other health related charities. Three Paintings commissioned by the Royal London and St Bartholomews NHS Trust. UP 2010 Acrylic & glitter on canvas, 123 x 153 cm. OVER 2010 Acrylic & glitter on canvas, 91 x 91 cm. HONEYSUCKLE SNOW 2010 Acrylic & glitter on canvas, 31 x 31 cm. All Painting now are part of the prestigious collection managed on behalf of the trust by Vital Arts. The paintings have since been included in the BBC Your Paintings web site, a national archive of works held in public collections. Your Paintings is a joint initiative between the BBC, the Public Catalogue Foundation (a registered charity) and participating collections and museums from across the UK.